This Saturday is Cinco de Mayo (fifth of May), and many will be celebrating Mexico's victory over the French forces with a "fiesta" full of Hispanic cuisine. With so many mouth-watering foods to choose from, including quesadillas, chips and guacamole, and churros, the food is easy to plan. However, it's the drinks, or should I say non-alcoholic drinks, that may have your head spinning on what to serve. Agua Fresca, meaning fresh water, is a refreshing drink that most every roadside vendor in Mexico is sure to have. It's a healthy way to enjoy fresh fruit, and a simple beverage to make up ahead of time before guests arrive at the party. Agua Fresca is typically made with fresh pureed fruit, water, a hint of sugar and fresh lime juice. Fresh herbs, such as mint or rosemary, may also be added for additional flavor. Most any ripe fruit is fine to use, including watermelon, cantaloupe, strawberries, mangoes, peaches or pineapple. All you need is a blender or food processor to puree the fruit. With only a small amount of sugar added, this low-calorie beverage is an excellent way to meet daily fruit needs. Aside from traditional fruit juice, drinking your fruit is a nice change of pace from eating whole fruit as a side dish. However, a balance of both is preferred as fruit juice and Agua Fresca will not have as much dietary fiber as whole or cut fruit. 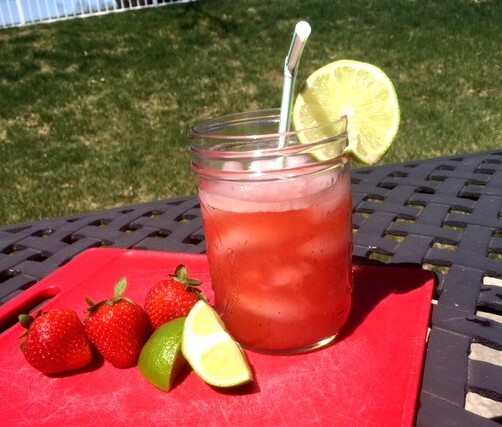 As the weather is finally getting warmer, throw some fruit in the blender and serve yourself a tall refreshing glass of Agua Fresca! Add strawberries (or other fruit), 1 ½ cups water, sugar and lime juice to a blender and blend until smooth. Strain through a strainer into a large pitcher. Stir in the remaining 1 ½ cups water. Refrigerate for at least 1 hour. Serve in glasses over ice.